Iceman, Firestar and Spider-Man together? Hell’s yeah baby! This issue has Bobby teams up with fellow mutant Angelic Jones aka Firestar and with the famous wall crawler himself, Spider-Man to take down a giant Ice Monster. Any fan of the original Spider-Man and his Amazing Friends cartoon would love this issue, if anything, just to see the dynamic and camaraderie between these heroes. I would love to see a full on mini series with these superheroes together! Check out my thoughts on this issue in the video, but there are spoilers! Emma Frost once took over Iceman’s body and show him a glimpse of the true potential that Bobby Drake possessed within his Omega level mutant status. This issue has Iceman teaming up with Frost on a personal endeavor for a situation involving her openly gay brother, Christian Frost. This issue is small in scale but still quite relevant in today’s society with mentioning of Christian being tortured when going through gay conversion therapy. This was written by Sina Grace and illustrated by Nathan Stockman. Many spoilers in this video! Iceman #1 – Marvel’s Most Famous Gay Mutant is Back (2018) – Comic Book Review – SPOILERS! Everyone’s favorite ‘dad joke’ spinning, Omega Mutant and badass Marvel Comics gay superhero, Bobby Drake aka Iceman, is back in a limited series run. Bobby investigates a missing Morlock in the sewers with the help of X-Men team member Bishop. What do they find? What do they prevent? Check it out in this first issue review with MAJOR SPOILERS! This issue is published by Marvel Comics, written by Sina Grace and the artist is Nathan Stockman. Hell’s yes!!! I absolutely loved writer Sina Grace’s take on Bobby Drake, aka Iceman, in his Marvel ongoing series. 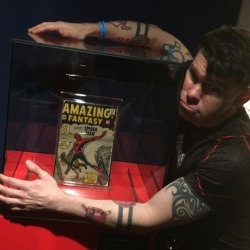 It is rare for a gay character to lead his own comic book in a mainstream comic company and even more rare for a gay writer to helm the series. There are many people that were upset at such an established character coming out as being gay, even though there are many that spend their entire lives in the closet. I felt as though Iceman’s first series was cancelled abruptly despite sales not even being shown at the time of cancelation, so it’s heart warming to see that there are others out there that wanted this series to return. It also looks like the new series will get rid of that god awful red costume that was used in the previous series and return to a more classic look. 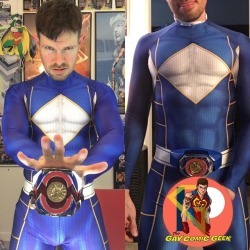 I have to say well done and I am totally making this costume! Without a doubt! Marvel has posted an interview with the writer, which is again Sina Grace, on their website. Check it out when you get a chance. I am stoked about this series returning! The final issue to Iceman has come out. Bobby Drake is an Omega Level mutant and his ongoing series was phenomenal under the writing of Sina Grace. He has gone through a lot of drama but he is beyond a doubt one of the most amazing of the X-Men. Here’s my thoughts on the last issue in this attached video. What did you think of this series? The Iceman series is near the end. Wolverine’s son Daken, has taken it upon himself to torture Bobby Drake and steal one of his recent mutant teenager recruits and kill Iceman’s new boyfriend Judah. 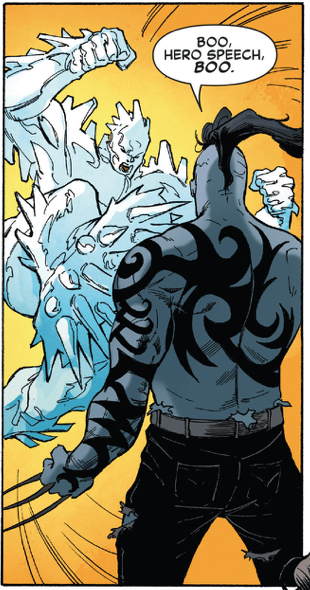 So this issue is a huge epic battle – Iceman vs. Daken.